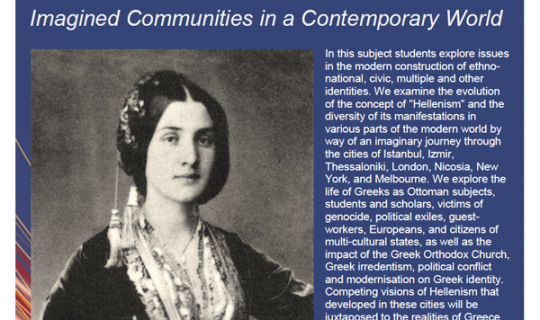 LaTrobe University offers a summer intensive subject entitled "Imagined Communities in a Contemporary World" at the Greek Centre, from 8 January to 14 February 2019. In this subject students will investigate civil wars motivated by ideological differences within a single culture or by identity conflicts over ethnicity, race, and religion within a multiethnic polity. They will explore similarities and differences in the experiences of Spain, Italy, Greece and Cyprus with nation-building, social revolution, modernization, civil war, and reconciliation in the twentieth century. The response of the International community to civil conflict and ethnic tensions in these countries is examined together with the ways in which outside intervention has shaped the length and internal dynamics of the conflicts. We conclude with an assessment of the prospect for a lasting peace in Cyprus and of the challenges of justice, reconciliation, and economic reconstruction. Cross-Institution subject enrolment at La Trobe University for students from another higher education provider available for this subject. The duration of the course is 6 weeks by 6 hours per week (Tuesdays and Thursdays, 5.30pm-8.30pm). Begins 8 January 2019 and ends 14 February 2019. Venue: Greek Centre for Contemporary Culture, 168 Lonsdale Street, Melbourne.